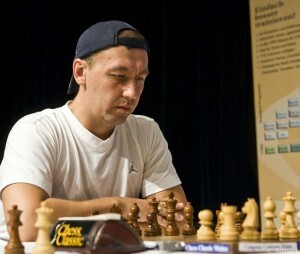 Gata Kamsky is one of the eight players set to play in the Candidates Matches in April 2011. The event was originally earmarked for Baku, then switched to Kazan, only for Anatoly Karpov to recently propose moving it to Kiev, in which case Azerbaijan might lose their wild card for Mamedyarov. Kamsky, in the one reply I’ve left out below, expressed his surprise at the changes and said he had no information beyond what he reads in the media. He also praised the organisation of chess events in Azerbaijan and said he’d have happily played the matches in Baku. The Baku Open 2010 is taking place in the hotel resort of Novkhana, 21 km from the centre of Baku. Have you been for a walk around Baku yet? Strangely enough, not yet. I’ve barely been in Baku at all as I came straight to Novkhana, which is a very interesting place to be just now. After all, it’s the height of the beach season and the hotel’s full. So now I’m mainly swimming, sunbathing and building up strength. I was aiming to go into town, but a few plans changed and for the moment I’m not sure how that’ll go. Last year it was as if it wasn’t the summer season any more, so I had to just play chess, while now it’s possible to combine business with pleasure. I can relax and also play some chess, and perhaps it’ll be possible to improve on my result. I must admit I don’t yet know who’s going to play in the coming tournament, but in any case, as always, I’ll play to win. […] By the way, doesn’t the recent information about a possible switching of the matches once more from Kazan to Ukraine create more hassle for the players? Of course, switching events like that has a certain direct influence on the players. After all, they’re planning their preparations which are partly dependent on where the tournament’s going to be held. Besides, as the Candidates Matches were going to be held in Azerbaijan Teimour Radjabov and Shakhriyar Mamedyarov were meant to play, while now in connection with moving them elsewhere the current organisers are trying to drag in their own chess players. So that you might prepare for one player and only at the last moment find out it’s going to be someone else entirely. It’s possible that with the Ukrainian Chess Federation having a new president Ukraine now has new ambitions. As far as I understand, the Ukrainians are supporting Anatoly Karpov and his bid to hold the Candidates Matches in Ukraine, which is perfectly logical. Of course, all of that violates the established rules according to which the line-up of participants had been established, and the players themselves had already started to prepare for their opponents. And to introduce any sort of changes now in the line-up of players for the Candidates Matches would be illogical, inconsistent and groundless. In that case can it be assumed that if Anatoly Karpov wins the election for FIDE president then the venue for the Candidates Matches might change again? I’m more inclined to think that won’t happen as the line-up has already been confirmed, and it was made public. Even with countries, when a new government comes in it doesn’t alter the recent decisions of the previous administration. So in the given situation I don’t think that there’ll be any significant changes. Of course, the venue for the Candidates Matches might still change, but the main thing is that the line-up of players doesn’t change. I think chess players have got used to traveling all around the world and playing in different conditions, so for many that question probably won’t be so critical. And what do you think about increasing the number of games in the Candidates Matches? That question was raised in the recent FIDE Council and someone was against it there. If there’d been a unanimous desire to increase the number of games in the Candidates Matches then it would have happened, but in the absence of unanimity they left the number of games unchanged. In my opinion the number of games makes no difference as the main thing is how well you’re prepared for the Candidates Matches. And then of course playing three matches in a row isn’t so easy. As for preparation, your opponent is very well known to you. Are you going to construct your strategy based on your match? Yes, it seems as though I’m going to have to play Veselin Topalov. How can I put it (laughs), for now it’s a military secret. After all, no-one talks about their secrets and preparation strategy until after the match is over. If the match goes well for me, then I’ll tell you, if not, then there won’t be much point in talking about it (laughs). By the way, which of the candidates do you prefer in the upcoming Election for FIDE President? To be honest, I don’t know. I wouldn’t want to meddle in politics. The last time I got involved was in 2006 in Italy when I supported Bessel Kok in the FIDE Presidential elections, as I considered him to be the best candidate at the time. Since then I haven’t got involved in those affairs. I must admit that I don’t know how Mr Karpov will conduct himself in terms of organisation, if he has any experience of organising tournaments or running any structures or organisations. If he has, then it’ll be interesting to see how he compares to Mr Ilyumzhinov who, in turn, has done an awful lot for chess. It’ll be very interesting, but I won’t support either of the candidates. One of the most important upcoming events is the World Chess Olympiad. How do you rate the chances of your team? Recently we seem to have been playing decently, and we’ve got the will to improve on our previous results. The guys we’ve got are good enough, and each of them can play on any board. All of the guys are friendly and the team has a good atmosphere, so we’re expecting good results. Relatively recently you had a bit of a bad run, which you yourself linked to problems outside of chess. Now you’re back among the 2700 players. Is it possible to say that the crisis has passed? To be honest I don’t know yet. This year I’ve been in good form, after all 36 years old is a 20-year horoscope cycle. But yes, certain problems which I had a few years ago and which interfered with my match with Veselin Topalov have been resolved. So now I can concentrate exclusively on chess and we’ll see how things go for me on the chess stage. After the Olympiad I’m planning to play in a small tournament in the USA, and then in Gibraltar, but for now it’s hard to say anything definite. And of course the Candidates Matches are taking place in April. For me that’s competition number one, and I’ll focus my preparation on it.